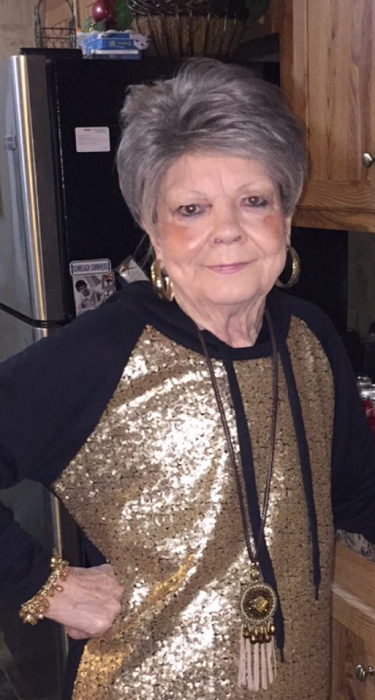 Memorial Services for Janie Middleton (Nanny) 73 of Emory will be held December 1, 2018 at 2:30 p.m. at Greenview Church with Mark Garett and Mike Fletcher officiating. Nanny went to her forever home with her family and loved ones by her side Tuesday, November 20, 2018 at her home. Nanny was born in Commerce, Texas on August 14, 1945. She is the daughter of the late Maurice and Haola Potts McElvy. She was of the Baptist faith and she attended Spur On Ministries in Quitman Texas. She married the love of her life Jackie Middleton on June 17, 1960 in Hopkins County. He proceeded her in death on June 18, 2001. She was also preceded in death by her sister Faye Stracener, brother in law Larry Morris and three great-grandsons Callen, Cayle and Conley Carter. She is loved and will be missed by her daughters Cindy Mills and husband Charlie of Emory and Stacy Middleton and fiance Kent White of Red Oak, Oklahoma; sister Rose Mary Morris; brother-in-law Leeman Stracener both of the Greenview Community; Four Grandchildren Jackie Beau Alcorn (Cassidy), Tanner Alcorn (Sam), Courtney Carter (Cy), Colby Hoover (Brittani); Eight Great Grandchildren Jackalyn, Braxton, Harlee, Carlee, Riggin, Delayni, Charleigh and Cash; and numerous nieces and nephews. Other survivors included special friend Carolyn Hinton and lots of friends that loved her very much.